Looking to throw your own event? Itty Bitty Schnitty loves a great party! Our catering services can be customized to fit your needs. Whether it's a private appetizer party, a wedding for 200, or boxed lunches for 1000, we've got you covered. We specialize in Austrian and German cuisine - fresh from our kitchen on wheels! Anything on our daily menu can be prepared from our food truck at the venue of your choice. For a unique experience, we are delighted to craft signature specials just for you! *Additional charges may apply. We proudly serve King County. Contact Us for dates and availability. Prices vary depending on season, crafted signature specials and volume. 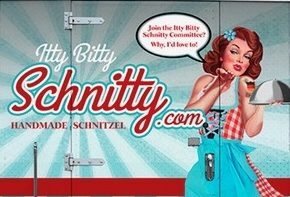 Contact us to get a custom quote at 206-693-4900 or email feedme@ittybittyschnitty.com.